In the previous articles in this series, I introduced you to SQL Server security principals and the part they play in authentication and authorization. At their most basic, principals are server and database entities that can request access to SQL Server resources. The most common principals are server logins, server roles, database users, and database roles. SQL Server provides a number of built-in principals that are added automatically when you install a SQL Server instance or create a database. In some cases, it’s not always clear when and how to use these principals. For example, SQL Server automatically adds the public server and database roles. Unlike other fixed roles, you can modify their permissions. However, this can impact common database operations, so you must proceed cautiously if changing the default configuration. In this article, I dig into some of the more confusing built-in principals to help you better understand how they fit into the larger authentication picture. I created the examples for this article on an instance of SQL Server 2017, but much of the information applies to SQL Server editions going back to 2014 or earlier. Regardless of which edition you’re using, you should understand how these built-in principals work before enabling them or modifying them in your production environments. The sa login, short for system administrator, is one of the riskiest server-level principals in SQL Server. It’s automatically added as a member of the sysadmin fixed server role and, as such, has all permissions on that instance and can perform any activity. If the login were hacked, the attacker could do unlimited damage. You cannot drop the sa login, but you can disable it. If you select Windows Authentication when installing SQL Server, the database engine assigns a random password to the account and automatically disables it. If you then switch to SQL Server Authentication, the login remains disabled, and you must manually enable it. If you select SQL Server Authentication during installation, the account will be enabled, but you must provide a password, so make sure it’s a strong one. Even if the login is enabled, you should avoid using it for your applications. In fact, unless a connecting system absolutely requires the sa login, it’s best that the account remains disabled. If the login is disabled, the is_disabled value will be 1, as shown in Figure 1. The statement uses the sys.server_role system view and sys.server_principals system view to return the members of the sysadmin role, as shown in Figure 2. Of course, if you were to enable the login, you would need to assign a much stronger password than the one shown here. Moreover, if you’re just trying all this out, be sure to perform your modifications in a non-production environment. 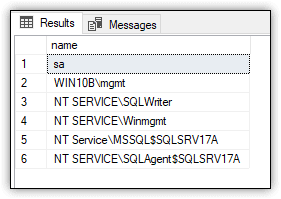 In SSMS, launch a new query. On the new query tab, right-click a blank area in the query editor, point to Connection and click Change Connection. In the Connect to Database Engine dialog box, select SQL Server Connection from the Authentication drop-down list. The form will be updated to include login and password text boxes. Type sa for the login and the password you provided when you enabled the login, and then click Connect. The query should run with no problem because the sa login is permitted to do anything on the server. On my test system, the SELECT statement returns 32 rows. Next, launch a new query and again try connecting with the sa login, following the same steps outlined above. This time, you should receive an error similar to the one shown in Figure 3. Whenever possible, you should ensure that the sa login remains disabled. Also, consider renaming the login to provide another line of defense. Because the login is so well known, it’s a frequent target for cybercriminals who have lots of tools at their disposal for cracking passwords. Once they’ve gotten into your databases, you might not be able to stop them until it’s too late. 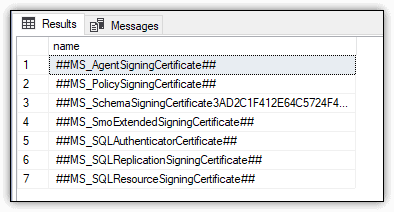 When poking around SQL Server, you’re likely to notice a set of server logins whose names start and end with double hash marks, as in ##MS_PolicySigningCertificate##. The logins are certificate-mapped accounts used by the database engine for internal purposes. You should not delete these or mess with them in any way. Figure 4 shows the results that the statement returns on my system. Notice that two of the logins are marked as disabled and their type listed as SQL_LOGIN, rather than CERTIFICATE_MAPPED_LOGIN. Despite these differences, Microsoft documentation specifically states that these two are also considered to be certificate-mapped logins. On my system, the statement returns the results shown in Figure 5, confirming that there’s a certificate for each enabled login. For the most part, you don’t have to worry about the logins, unless you’re involved in an audit or performing a security scan, in which case you might need to explain to the powers-that-be why these logins are showing up in your reports. Each SQL Server instance contains the public fixed server role, and each database (including system databases) contains the public fixed database role. All logins belong to the public server role, and all database users belong to the public database role. You cannot drop either role, and you cannot add members to or remove members from either role. The database engine assigns a set of permissions to the roles by default. Logins inherit all permissions granted to the public server role unless a login has been specifically granted or denied those permissions. The same goes for the public database role. Users inherit all permissions unless they’ve been specifically granted or denied permissions. In this case, the public database role is specific to the ImportSales1 database, which was created as part of the examples in the previous article in this series. The database is a simple, contained database that includes only the Sales schema and the Customers table. You can refer back to that article for details about the database, or you can run this statement against another database. Figure 7 shows part of the results returned by the SELECT statement on my system. As with the public server role, I made no modifications to the public database role. By default, the role has been granted 176 permissions, the majority of which are the SELECT permission granted to system views. If you were to run the same query against the master database, it would return a much larger result set (2,254 rows on my system). In this case, the results would also include the EXECUTE permission, granted on system functions and stored procedures. 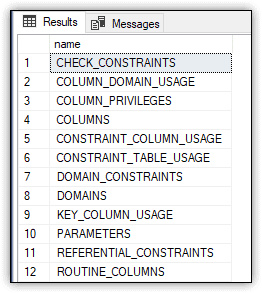 One way to check effective permissions without writing scripts yourself is to use Redgate’s SQL Census. It creates a report of who has access to what on your SQL Servers and makes best practice recommendations, like disabling sa accounts. It’s still in development but it’s a good starting point to check on your SQL Server permissions and undertake any necessary cleaning tasks. The public roles are different from other fixed server and database roles because you can grant, deny, and revoke permissions. Even so, you should avoid modifying the public roles and instead create one or more additional roles. However, if you work someplace that insists upon using the public roles, you should grant permissions to the roles only on securables that you want to make available to all users. In addition, you should avoid denying permissions because they can override the permissions granted to individual users or logins. You can also revoke permissions on the public roles, but be careful when doing so. SQL Server assigns a number of permissions to these roles by default (as you saw in the preceding examples), and many of those permissions are used for routine database operations. Revoking permissions on these roles can impact all logins or users. The dbo user is added as a member of the db_owner fixed database role. By default, the user is granted all permissions in a database and can perform all activities within the scope of that database. You cannot limit the dbo user or drop the user from the database. The SELECT statement should return dbo as the current user. The dbo user also owns the dbo schema, which is the default schema for all newly created databases and users, unless a different schema is specified. As with the dbo user, you cannot drop the dbo schema. In this case, the query is specific to the ImportSales1 database created for the previous article, but you can use any database. It should return the login for your current connection, as well as the dbo schema. The statement should return dbo, along with any other role members. When I ran the query on my system, I was still working within the context of the ImportSales1 database, so the query returned only dbo, which is tied to my login. On my system, the results indicate that sa is the associated login, along with dbo as the default schema, as shown in Figure 8. Because the dbo user is associated with the sa account, my login is added as a separate member to the db_owner database role. In this way, both my login and the sa login have full control over the database (assuming the sa login is enabled). Be aware, however, you might not see the same results on your system as I see mine. It’s possible that only the dbo user will be added to the role. It will depend on how you’ve configured your system and added the WideWorldImporters database. The query returned my login for both databases, as shown in Figure 9. You should also be aware of the query engine’s behavior when it comes to the dbo schema. When you query a database object without specifying a schema, the query engine first looks in your default schema if it’s other than dbo. If the object is not there, the query engine looks in the dbo schema. If the object is not in that schema, an error is returned. When you create a user, you can specify a default schema. If you do not, the dbo schema is assumed. Users with dbo as their default schema do not inherit the permissions granted to the dbo user. In addition, if you specify a default schema other than dbo and the user is a member of the sysadmin server role, the specified schema is ignored and the dbo schema is used. The default schema for all members of sysadmin is dbo. As with dbo, every database contains a guest user and a guest schema. You can use the guest user to grant database access to logins that are not associated with user accounts in that database, a strategy that should not be implemented lightly. Although the guest user cannot be dropped, it is disabled by default and assigned no permissions. Microsoft recommends that you keep it that way. If enabled, logins that should not be able to get into a database will have access. Do not enable the account unless you have a compelling reason to so. The guest user owns the guest schema. Like the user, the schema cannot be dropped. However, it contains no objects and has been granted no permissions. In fact, the guest schema is seldom used, if at all. The query should return a hasdbaccess value of 0, indicating that the user account is disabled, as shown in Figure 10. The query should also return guest as the default schema. Granting the CONNECT permission is all it takes to enable the guest user. If you rerun the previous SELECT statement, the hasdbaccess value should now be 1. If you were to enable the guest user, you might want to add objects to the guest schema specifically for that user to access, but chances are, you won’t be touching either one. Every database includes the sys user and sys schema. The sys user owns the sys schema. The user serves no other purpose. It’s associated with no logins and is disabled by default. In all likelihood, you’ll never need to interact with this user account. The sys schema is another story. The database engine requires the schema for internal use. You cannot modify or drop the schema. It contains a number of important system objects, such as system tables, catalog views, dynamic management views, and built-in functions. You’ve already seen several of the catalog views in action in the previous examples. The sys schema is particularly handy for accessing SQL Server metadata. Figure 11 shows the results I received when I ran the SELECT statement. The statement returns only the objects of type VIEW. Figure 12 shows part of the results I received. There were 473 rows in all. 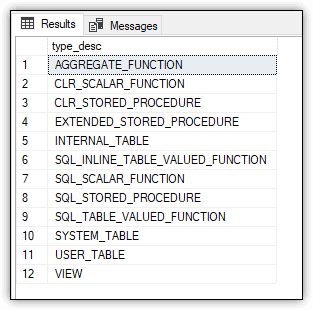 For more information about catalog views and dynamic management views, check out my Simple Talk article SQL Server System Views: The Basics. Like sys, every database also includes the INFORMATION_SCHEMA user and INFORMATION_SCHEMA schema. Again, the user is there only to support the schema. You cannot drop the user, but it is disabled by default. Figure 13 shows part of the results that I received. In all, there are 21 INFORMATION_SCHEMA views for the ImportSales1 database. For more information about INFORMATION_SCHEMA views, refer to the same Simple Talk article, SQL Server System Views: The Basics. 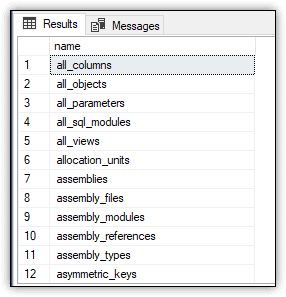 When working with SQL Server and its databases, it’s important that you understand how the built-in principals work, especially the ones I’ve covered here. For the most part, SQL Server attempts to configure these principals in a way that best protects your data, such as disabling the sa server login or guest database user, but this doesn’t prevent you from taking steps that can disrupt operations or, worse still, open your data up to security risks. The better you understand how to work with the server and database principals, the better you can protect your SQL Server instance and its databases.